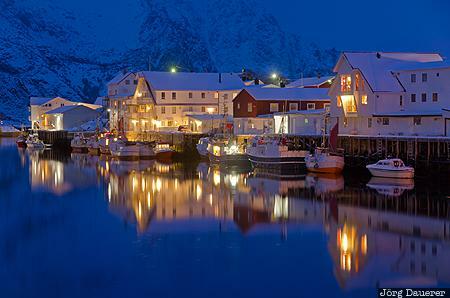 Fishing boats and houses and their reflexions in the calm water of the harbor of Henningsvær at the blue hour after sunset with steep snow covered mountains in the background. Henningsvær is in the south west of the island Austvågøy which is part of the Lofoten archipelago north of the arctic circle in Nordland, Norway. This photo was taken in the evening of a sunny day in March of 2013. This photo is part of the exhibition Blue Hour (October 2016). This photo was the image of the month in December of 2015. This photo is in the Photo Calendar "Norwegen". This photo was taken with a digital camera.